In a rare turn of events, the remnants of a tropical cyclone have crossed from the Pacific to the Atlantic basin ( Caribbean Sea ). 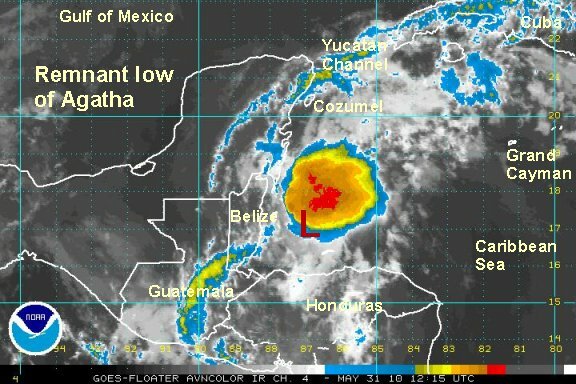 Tropical storm Agatha from the eastern Pacific moved into Guatemala and weakened. The remnant circulation is now about 75 miles east of Belize and north of the Bay Islands of Honduras. A cluster has developed and we'll have a look at the visible satellite imagery soon to see if any low level circulation is apparent. Tropical forecast models don't strengthen this weak low much but they do take the remnant low toward the Yucatan Channel then into southwest Florida. So, it's worth keeping an eye on. After studying the first visible satellite images, it looks likethat there is only a weak circulation present. Right now nothing to be concerned about. We'll keep the light on ... and keep watching it anyhow. The forecasts from earlier today look reliable. The low remains weak and is heading toward the Yucatan Channel. We are not expecting further development of this low. There may be some enhancement to the showers and storms over south Florida the next few days.